Durham Cave #1 is also well known for it’s archeological finds— “flint arrow-heads, stone hammers, beads, pestles, parts of human skeleton, and fossil bones of extinct animals.” The Lenni Lenape lived here for centuries prior to and after the Europeans came to Durham in the late 1600s. From Durham Cave #1 is a path that leads up to Durham Cave #2 which consists of the PRETTY ROOM housing mineral deposits, the BONE PASSAGE named so because bones of an opossum and raccoon were found there, and the WAITING ROOM. Durham has five defunct mines. Two are located on Rattlesnake Hill and three are located on Mine Hill. 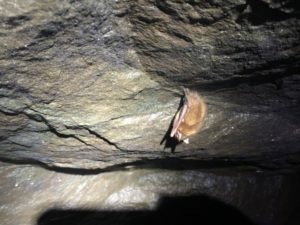 One of the mines on Mine Hill, aptly named Durham Mine (fitted with “bat-friendly” gates) is home to such national treasures, as the little brown bat, big brown bat, and the eastern pipistrelle (who are good for the environment as they eat mosquitoes and insects that destroy crops). 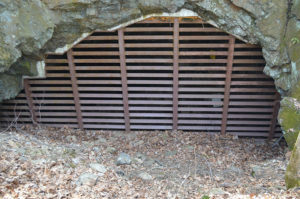 The mines, situated on a 90-acre preserved property that was acquired in 2002 by Heritage Conservancy, became known as the largest bat hibernaculum in Pennsylvania providing habitat for as many as 8-10,000 bats including every native species known in the area. Sadly the Durham bats, like others all over the east coast and beyond, were decimated by White Nose Syndrome. In a count taken in April 2015 only 13 bats were found. Yet there may be faint signs of hope that the survivors will be able to rebound. The Conservancy continues to monitor and maintain the site, hopeful of recovery in bat populations.